The Canadian Country Music Awards named ole its Publisher of the Year for a third consecutive year. The accolade was announced during the CCMA’s annual Awards week celebration which took place this year in Vancouver, British Columbia. Toronto-based ole also has offices in Nashville and Los Angeles. Some of the publisher’s success this past year included songs from Taylor Swift’s two albums. They also had country cuts with Rising Star Tara Oram, Road Hammers, Shane Yellowbird, The Wilsons, Doc Walker, The Higgins, Jason Blaine, Love and Theft plus tracks for Aaron Pritchett, Shea Fisher and Martina McBride. ole, one of the largest independent publishers worldwide, was founded about four years ago by Tim Laing and Robert Ott. The company now boasts a team of 30 industry professionals and a genre-diverse catalog of over 35,000 songs. ole focuses on acquisitions, creative development and publishing administration worldwide. 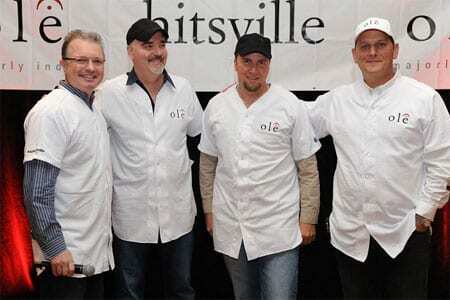 (L-R) Gilles Godard, Nashville Chief Creative Officer; Robert Ott, ole Chairman/CEO; Hitsville winner Shane Chisholm; and TMKO Law's Chris Taylor. During CCMA ole offered songwriters a chance to hit an instant single-song “home run” publishing deal. Writers, with song demos, were asked to start at first base and then move to second and third as various umpires judged their offerings. Along the way, most songs were Out! before making it all the way to home base. Shane Chisholm however, scored and was offered a deal.